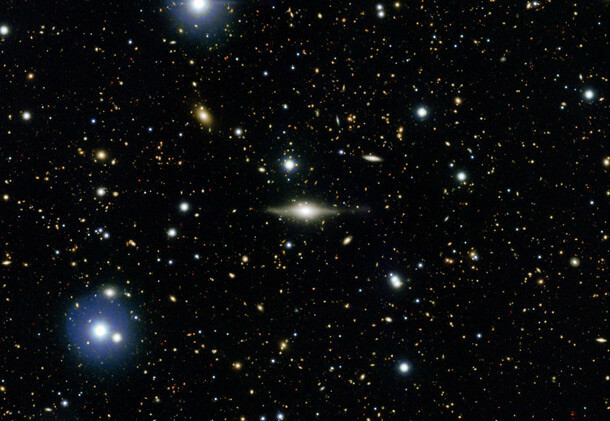 An ultradeep image that's *full* of galaxies! What happens when you take a monster 4.1 meter telescope in the southern hemisphere and point it at the same patch of sky for 55 hours? OK, I know. At first glance it doesn’t look like much, does it? Just a field of stars. However, here’s the important bit: I had to take the somewhat larger original image and reduce it in size to fit my 610-pixel-wide blog. So how much bigger is the original? It’s 17,000 x 11,000 pixels! If you happen to be sitting on a T1 line, then you can grab this massive 250 Mb file. And I surely suggest you do. There are over 200,000 galaxies filling this image! Here’s a zoom of the image, centered on what looked to me to be one of the biggest galaxies in the frame, a nice edge-on spiral. With the exception of a handful of blue-looking stars, everything in this zoom is a galaxy, probably billions of light years away. Those tiny red dots are galaxies so far away they crush our minds to dust: we’re seeing them with light that left them shortly after the Universe itself formed. By the way, that picture of the spiral there is not even at full resolution! 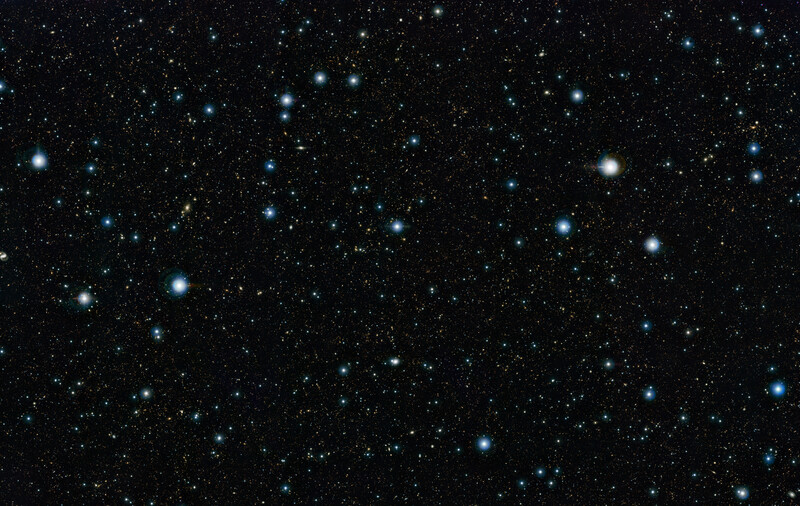 Just to give you an idea, I cropped out just that galaxy in the full-res image and inset it here. If you want to find it in the full frame, it’s about one-third of the way in from the left, and one-third of the way down from the top. Happy hunting. These images were taken with VISTA, the European Southern Observatory’s Visible and Infrared Survey Telescope for Astronomy (VISTA), a 4.1 meter telescope in Chile. 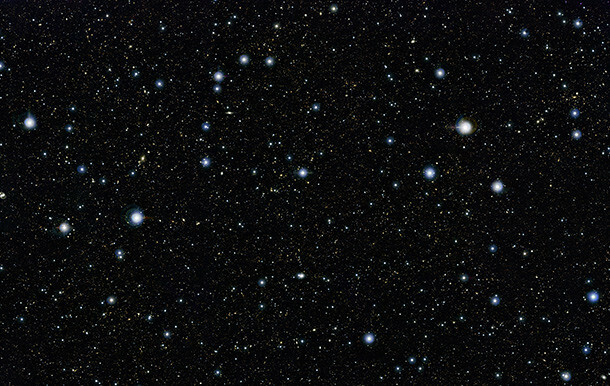 This huge image is actually composed of 6000 separate images, and is the single deepest infrared picture of the sky ever taken with this field of view. Hubble can get deeper, for example, but sees a much, much smaller part of the sky. By looking in the infrared we can see farther into space. Because space is expanding, light from distant galaxies gets red-shifted (like the Doppler effect on a cosmic scale). Young galaxies are generally furiously forming stars, and that makes them blast out ultraviolet light. 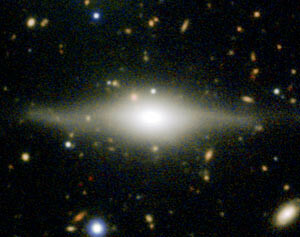 But a young galaxy seen from very far away has that UV light red shifted into the infrared. So to us, billions of light years distant, we see it pouring out IR light. Looking there means we can see these extraordinarily remote galaxies more easily. If you scan the full-size image, you’ll see lots of tiny, very red dots. Those are most likely the most distant objects in this picture, appearing redshifted, dimmed, and shrunken due to their terrible distance. Also, looking in the infrared makes stars that look red to our eyes appear blue in the image! Most of the stars in this image are weak, cool, dim red dwarfs. They look blue because this image is false color. It uses three filters to isolate different colors of infrared: 1.3 microns, 1.7 microns, and 2.2 microns (colored blue, green, and red in this image, respectively). The reddest light the human eye can typically see is about 0.7 microns, so these are well outside human range. Many red dwarfs put out light at 1.3 microns, but not nearly as much at 1.7 and 2.2. Since the 1.3 micron light is colored blue in the image, that makes the stars look blue, even though to you they’d look red! Isn’t that interesting? There’s a long jet of material apparently coming from that bloated galaxy on the left (I increased the brightness and contrast of this picture to make it more obvious; it was subtle in the original image but I have a lot of practice picking out things like this). Big galaxies have supermassive black holes in their cores, and these sometimes accelerate huge beams of matter and energy that blast out. But wait! The stream goes right through that smaller galaxy on the right. Is that a coincidence — the jet is coming from the big one and happens to pass in front of a more distant galaxy? Or is that smaller one the source of the jet, and actually has two jets coming out of either side? That’s actually a more common occurrence. Beats me. I could argue either way. We’d need spectra of the galaxies to know for sure. And funny: I went back to the original image to see where I cut that galaxy out, and now I can’t find it. Holy crap. I mean, seriously, I couldn’t find it. That’s how big this image is. 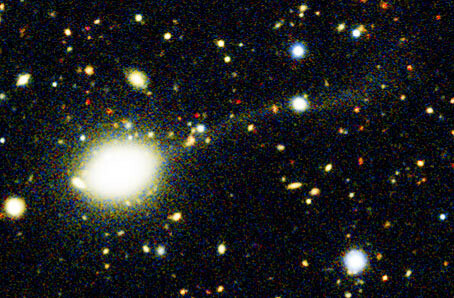 Of course, you can find a dozen galaxies just like it. I also found several gorgeous spirals (look all the way on the left; one is cut off on the edge of the frame and it’s really something). Some were edge-on like the one above, others face-on. There are countless blobby ones, and even more that are just dots, so far away we see them as dimensionless points. I’ve spent years studying all this, and it still sometimes gets to me: just how flipping BIG the Universe is! And this picture is still just a tiny piece of it: it’s 1.2 x 1.5 degrees in size, which means it’s only 0.004% of the sky! And it’s not even complete: more observations of this region are planned, allowing astronomers to see even deeper yet. Science is wonderful. Building on the knowledge developed before us, our tools improve and our ability to explore expands. Piece by piece, photon by photon, galaxy by galaxy, we’re examining this Universe we live in and understanding it better every day.